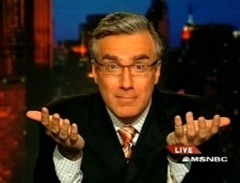 When the vitriol is too much for Keith Olbermann, something is seriously wrong. The MSNBC prime time anchor parted ways with the far-left Web site Daily Kos on Wednesday, citing the site's apparent unflinching, see-no-evil attitude towards President Obama, and the omnipresence of wild leftist conspiracy theories there. "You want Cheerleaders? Hire the Buffalo Jills," Olbermann wrote. "You want diaries with conspiracy theories, go nuts. If you want this site the way it was even a year ago, let me know and I'll be back." The divorce came after Kossacks relentlessly railed on Olbermann for having the gall to criticize their dear leader for his let-down of a national address on Tuesday. He took to his Twitter account to defend the decision. Olbermann's explanation apparently did not satisfy the Kossacks, one of whom wrote that Olbermann had "transformed from Edward Murrow wannabe to a clown." But what really got Olbermann riled up were some of the comments on that post. The one that he chose to highlight accused him and his MSNBC superiors of fabricating their outrage over the president's address in an attempt to improve ratings. That Keith did not appreciate. And now he's gone. Are you happy, Kossacks?